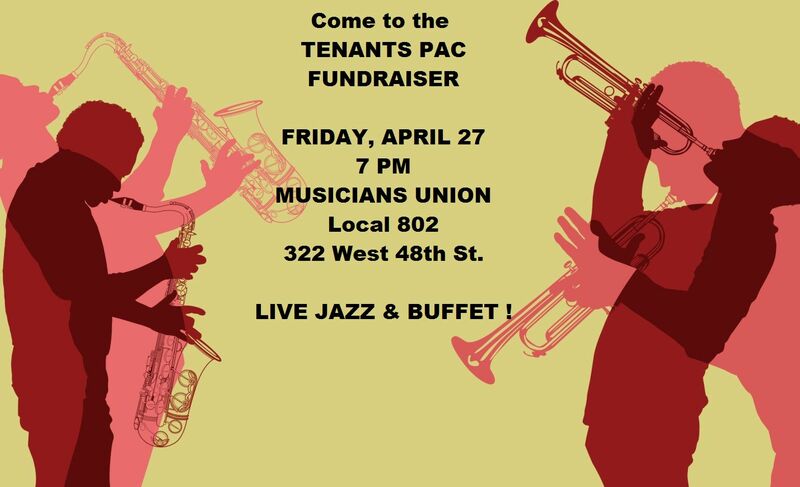 This Friday, April 27 - a Tenants PAC fundraiser (see below). Tuesday, May 1 - The Rent Guidelines Board holds a preliminary vote, and tenants - the 99% - join Occupy Wall Street in a "Tenants General Assembly" outside the hearing space at 5 PM. Cooper Union's Great Hall, 7 E. 7th St. (3rd Ave.) - and consider going in to testify! Meet Assembly Member George Latimer at Friday's event. He will be running for an open State Senate seat against a Republican New York City landlord. Buffet dinner and great jazz! 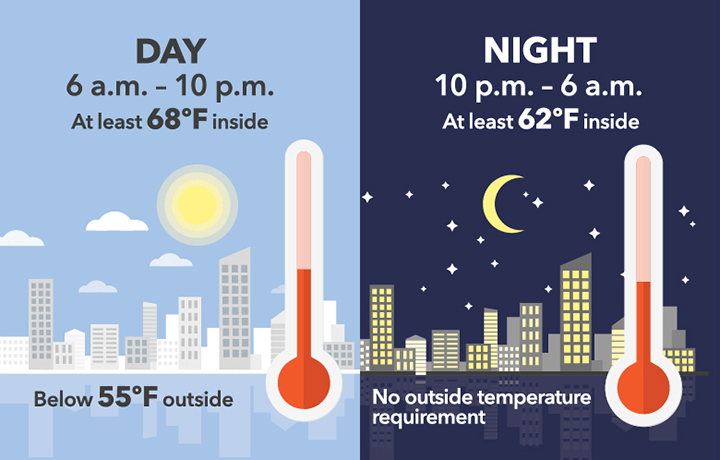 Click here for the flyer to share with friends. The City Planning Commission overrode objections from Community Board 7and granted permission to Jewish Home Lifecare to build a 20-ish story building in what is now the parking lot of Park West Village between Whole Foods and P.S. 163 - assuming JHL gets the proper other permits. The Park West Village Tenant Association won the first step of a lawsuit against JHL for the loss of PWVTA's parking lot - and the ability to park right in front of one's home. The PWVTA needs to raise $75,000 as a bond to pursue the suit. Westsiders for Public Participation, Inc. just wrote a letter to the state's health commissioner urging that its permit for JHL's move be denied for lack of community involvement - and the effort to keep the community in the dark. RENT BILLS: Smajlje will try to get rent bills to tenants a day or two earlier, possibly by having them delivered by hand in the building (as used to be done). He asserted that the delay was integrating delayed Con Ed information into the rent bills. Smajlje stated that NO tenant would face legal consequences for paying the April 2012 bill late as long as it was paid within the month of April. There are, of course, no “late fees” for rent stabilized tenants in this building, although market-rate tenants may be subject to them. II. LEASE CORRECTION: Although all rent stabilized tenants had a permanent MCI increase added to their bills in April 2011, a few tenants in this building found that Stellar added that amount AGAIN on their lease renewals. Smajlje said those lease renewals would be reviewed and corrected. 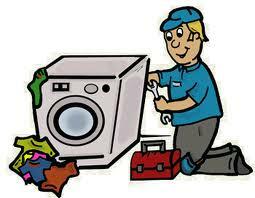 · Repair procedure (reaffirmed) : Tenants who need a repair should write it in the book at the guard's desk in the lobby. 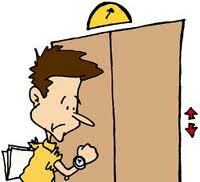 If the repair is not made within a week, tenants should telephone Stellar's local office. These repairs include closet rollers to repair the doors, and decayed silicon around the posts holding the balcony railings. · Community Room tables and chairs: Stellar will purchase two more tables and ten chairs for the Community Room. PLEASE DO NOT BORROW THEM from the Community Room. Tenants using the room need all the chairs and tables they can get. So the chairs and tables will be kept in the locked closet; the guard will have the keys. · Compactor Rooms: New signs have been posted. Tenants are urged to follow them. o Stellar has notified the repair company of the complaints reported. o Smajlje said they would work on refinishing the elevators whose current surface looks dirty all the time. o Stellar will place a “lobby” notice opposite the elevators on the ground floor. · Intercom: The list will be reformatted so that every tenant named on the lease is listed in alphabetical order – and not as it now is, with the name of their apartment-mate earlier in the alphabet. · Hallway carpets: The building has just bought new vacuum cleaners for the maintenance staff to use. That may keep the hallway carpets cleaner. · Hallway exit signs: Stellar will not change them for higher or smaller signs. Watch your head. o There is now a recycle bin and a garbage bin. Please only put recyclable materials in the recycle bin. o The machines will be replaced when the contract with Coinmach expires in August 2015. In the meantime, Coinmach will service the machines monthly in addition to coming to make repairs. Please call Coinmach to report break-downs and to get refunds, or write the problem in the book at the guard’s desk. Plantings: Stellar will shortly plant flowers around each tree in front of the building. · Tenants to Meet Smajlje: Smajlje said he would provide coffee and donuts (not from the building fund) for a get-together with tenants in order to hear what individual tenants want to tell him about the building. Date to be set later. The Tenant Association is scheduled to meet monthly with Lu Pedraza, and every two months with Lu and Smajlje. Our next meeting with Lu is scheduled for Wednesday, May 16 at 11 AM, and the next meeting with both Smajlje and Lu is scheduled for Wednesday, June 13 at 11 AM, all in the Community Room. Send us your concerns! Our next General Tenants Meeting will be WEDNESDAY, MAY 16 at 8 PM in the Community Room. Bring a chair and a neighbor! In at least a temporary victory for Park West Village tenants, a judge agreed to an injunction preventing any modification of the parking lot that the nursing home plans to relocate to.